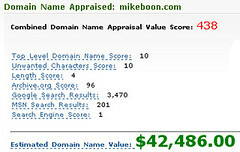 LeapFish offers a free domain appraisal service. For fun, I decided to pit the two domain names that resolve at this site against eachother. TorontoMike.com vs. torontomike.com. It wasn't even close. 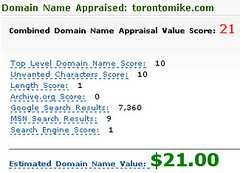 The estimated domain value of TorontoMike.com is $21.00 while the estimated domain value of torontomike.com is $42,486.00. This, of course, is because torontomike.com had an 8 year head start on TorontoMike.com. By the way, I won't sell torontomike.com for a dime under $50,000.00.